INTRODUCTION: In Natural Orifice Transluminal Endoscopic Surgery (NOTES), intentional perforation of viscus to access the peritoneal cavity violates basic principles of surgery and raises questions regarding its safety. 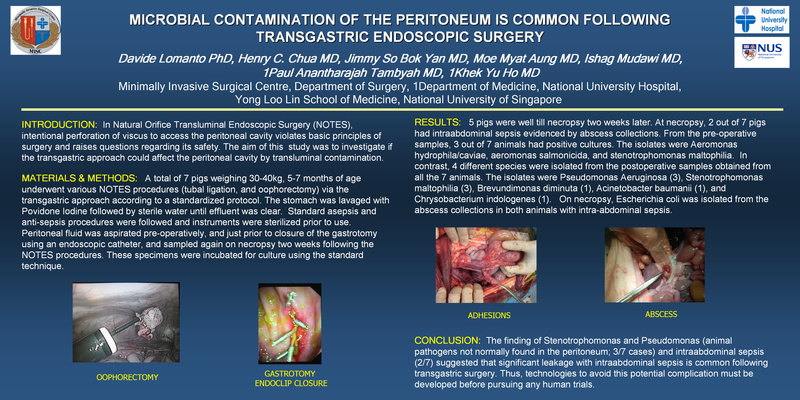 The aim of this study was to investigate if the transgastric approach could affect the peritoneal cavity by transluminal contamination. MATERIALS AND METHODS: A total of 7 pigs weighing 30-40kg, 5-7 months of age underwent various NOTES procedures (tubal ligation, and oophorectomy) via the transgastric approach according to a standardized protocol. The stomach was lavaged with Povidone Iodine followed by sterile water until effluent was clear. Standard asepsis and anti-sepsis procedures were followed and instruments were sterilized prior to use. Peritoneal fluid was aspirated pre-operatively, and just prior to closure of the gastrotomy using an endoscopic catheter, and sampled again on necropsy two weeks following the NOTES procedures. These specimens were incubated for culture using the standard technique. RESULTS: 5 pigs were well till necropsy two weeks later. At necropsy, 2 out of 7 pigs had intraabdominal sepsis evidenced by abscess collections. From the pre-operative samples, 3 out of 7 animals had positive cultures. The isolates were Aeromonas hydrophila/caviae, aeromonas salmonicida, and stenotrophomonas maltophilia. In contrast, 4 different species were isolated from the postoperative samples obtained from all the 7 animals. The isolates were Pseudomonas Aeruginosa (3), Stenotrophomonas maltophilia (3), Brevundimonas diminuta (1), Acinetobacter baumanii (1), and Chrysobacterium indologenes (1). On necropsy, Escherichia coli was isolated from the abscess collections in both animals with intra-abdominal sepsis. CONCLUSION: The finding of Stenotrophomonas and Pseudomonas (animal pathogens not normally found in the peritoneum; 3/7 cases) and intraabdominal sepsis (2/7) suggested that significant leakage with intraabdominal sepsis is common following transgastric surgery. Thus, technologies to avoid this potential complication must be developed before pursuing any human trials.